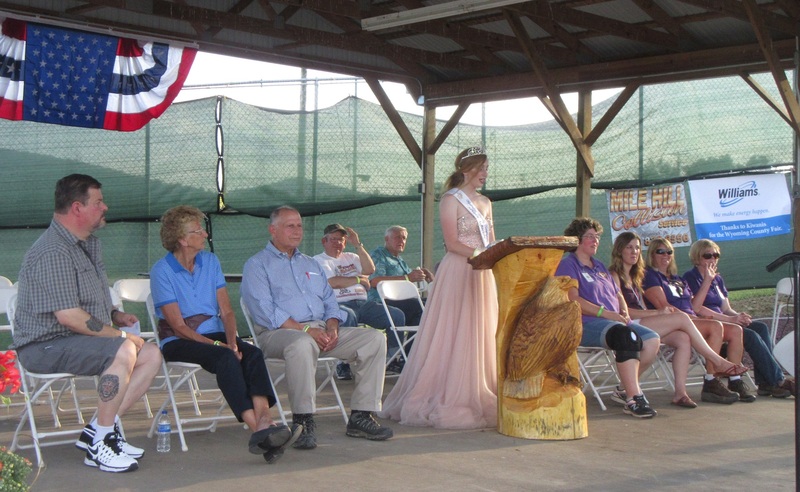 Participating in the opening ceremony of the Wyoming County Community Fair on Aug. 29 were (top, from left) county commissioners Tom Henry and Judy Mead; Rep. Lou Barletta’s senior adviser Conrad Falvello; 2017-18 fair queen Alexandria Glaush; and fair board officers Kim Scott, Marjorie Singer, Stephanie Scavone, and Pam Burke. 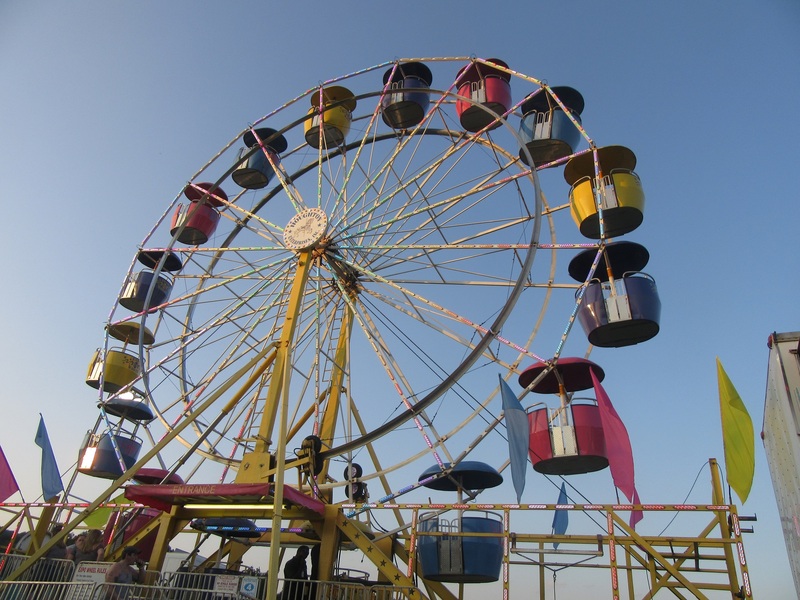 Above, the setting sun glances off the ferris wheel as the lights come on for opening night of the fair at Meshoppen. Attendance for opening day of the Wyoming County Community Fair was noticeably low, but a welcome drop in temperatures through the weekend helped turn those numbers around. 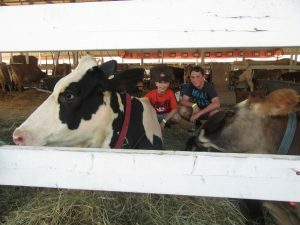 Aug. 29’s high of 91 degrees at Meshoppen was a few degrees shy of a record, but heat indexes were near 100 for much of the day, one of two that senior citizens were invited to attend the fair for free. 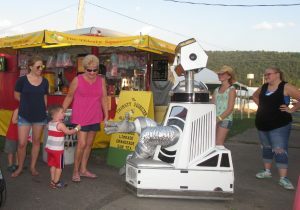 Nonetheless, the show went on, and vendors did their best to hawk their wares while ride and game operators sweated quietly between participants. 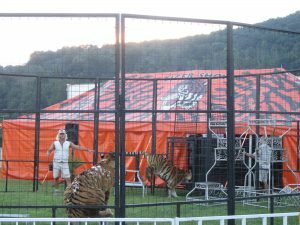 Livestock handlers worked overtime to keep their animals cool, while a truck pull, chainsaw carving exhibition and live tiger show proceeded unabated. The best news for people not as fond of crowds as others was that lines and wait times were short. 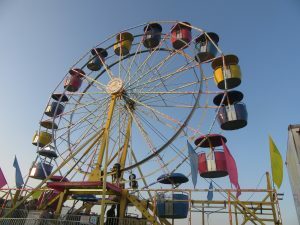 The fair ceremoniously kicked off at 6 pm, even though gates had opened at 10 am. 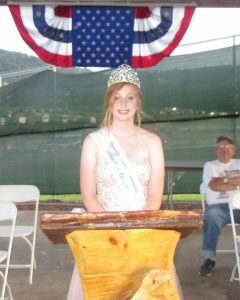 Outgoing fair queen Alexandria Glaush welcomed dignitaries to the Veterans Memorial Pavilion and introduced the fair officers. Wyoming County Commissioners Tom Henry and Judy Mead presented a check to the officers. Vice president Kim Scott noted that there were a number of new food vendors this year, in addition to the community organizations such as fire companies and churches who have permanent stands on the fair grounds. 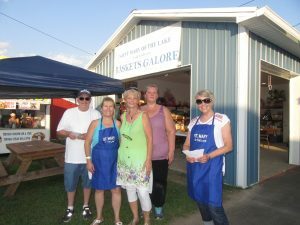 Parishioners of St. Mary’s of the Lake were proudly selling raffle tickets from their new building. Scott was also happy to welcome Soldiers Solutions, an organization formed and staffed by military veterans that sells clothing manufactured by veterans. Burke was also happy to host the SWAN Program (statewide adoption and permanency network), which has led directly to the adoption of youths in need of loving homes in previous years. “We’re proud of that. It’s important to us,” Burke remarked. Other highlights in the following days included a trick horse show by the Rhinestone Cowgirls and an expanded archery tournament that started on Saturday and wrapped up on Monday. “We went from having archery one day during the fair to having it three days,” said Burke, citing T-Town Archery for donating their time and expertise to ensure the success of the event. 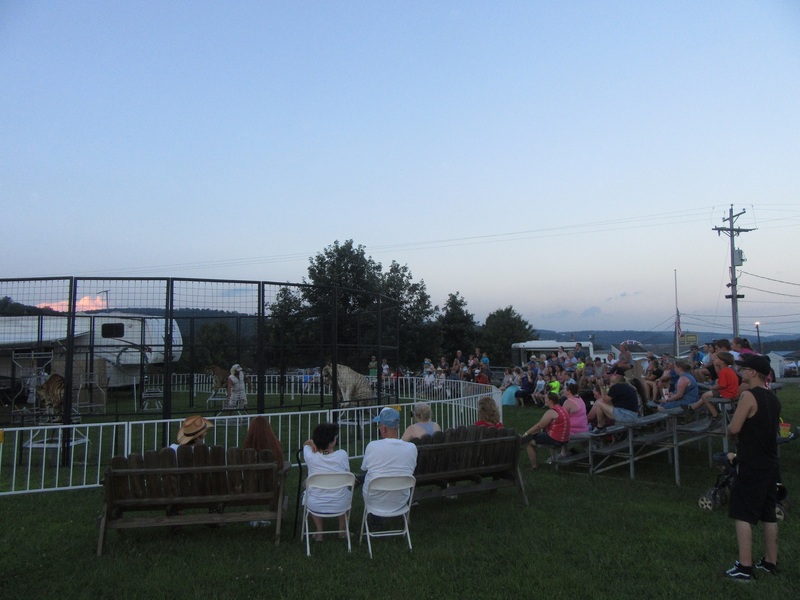 In addition to free live music each evening of the fair, country artists Dylan Scott and Devin Dawson were the headline acts for Saturday evening. 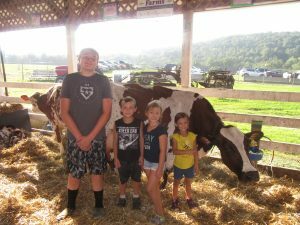 The Wyoming County Community Fair ran from Aug. 29 to Sept. 3. There was also some intermittent rain on Friday evening, and the fair closed with a bang as a thunderstorm roared through on Monday evening, squelching another day of late summer heat. 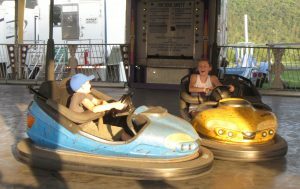 Youths who were flooded out at the Troy Fair in Bradford County are getting in their fair experience this week at Meshoppen. Buddying up with a cow named Lorna are (from left) Dan Hoppaugh from Columbia Crossroads and Boyd Watson, Alexis Hardy, and Ellie Watson of Troy. 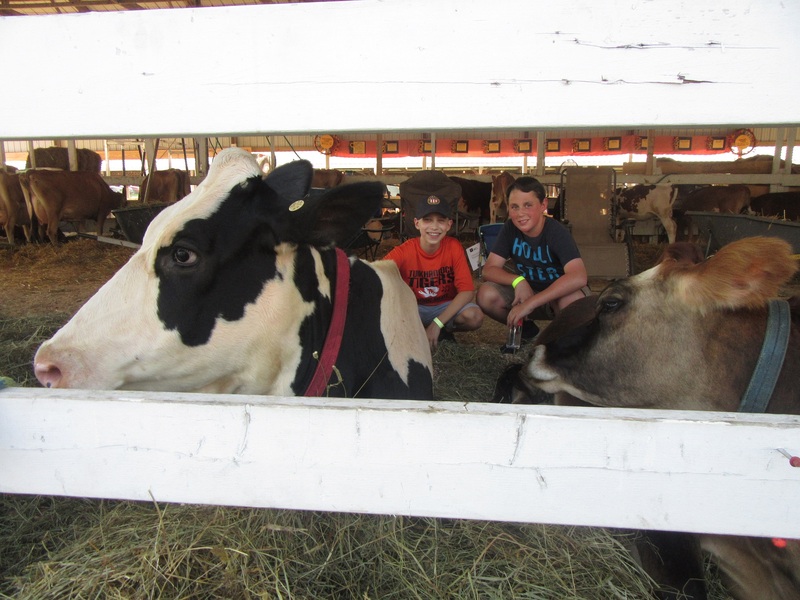 Checking out the inhabitants of the livestock barns at the Wyoming County Community Fair on Wednesday were Mason Mosher (left) of Lemon and Matthew Astegher of Tunkhannock. 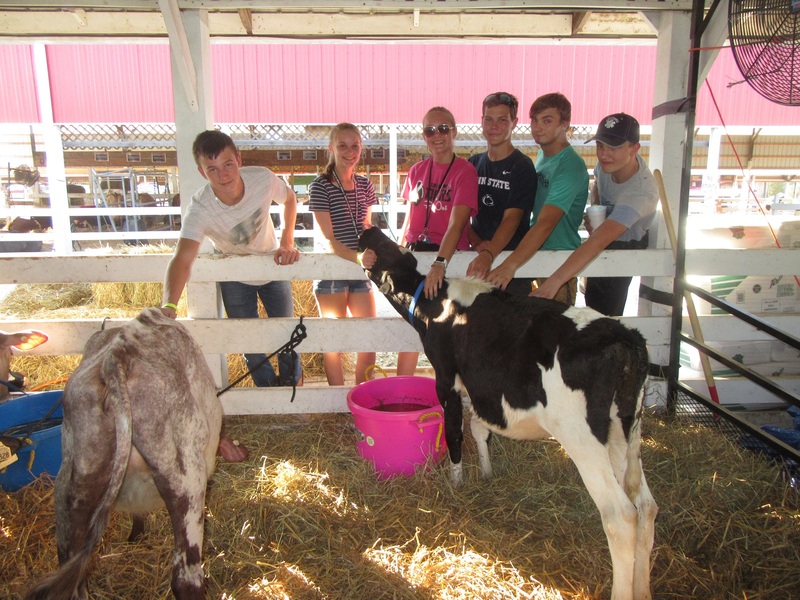 Tunkhannock High School students making bovine friends at the fair on Wednesday included (from left) Hugh Murphy, Liz Ronca, Katie Ramage, Billy Dziak, Shane Sherwood, and Alex Ronca. 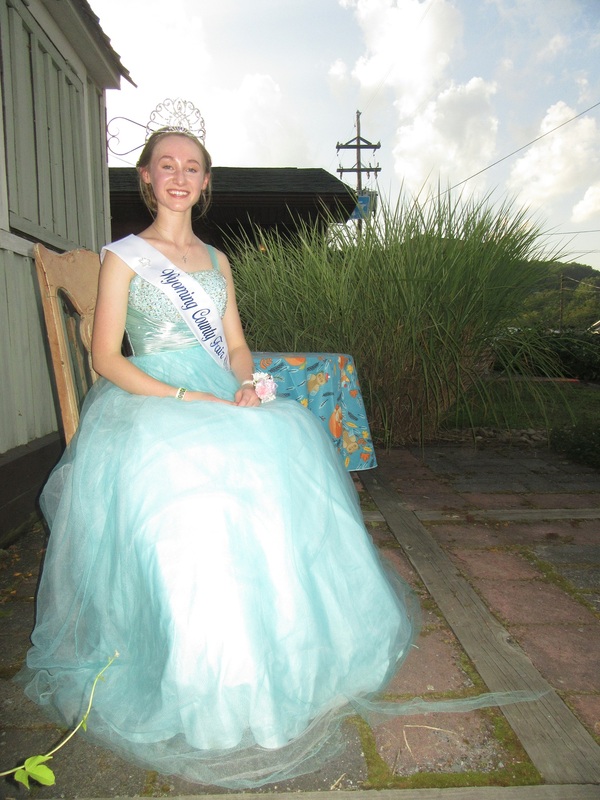 Taking a break from greeting guests on Wednesday night is 2018-19 Wyoming County Fair Queen Madison Sickler, an Elk Lake High School senior who resides in Meshoppen. Enjoying a classic sibling rivalry in bumper cars are Jacob and Kaylee Fryer of Wyalusing. 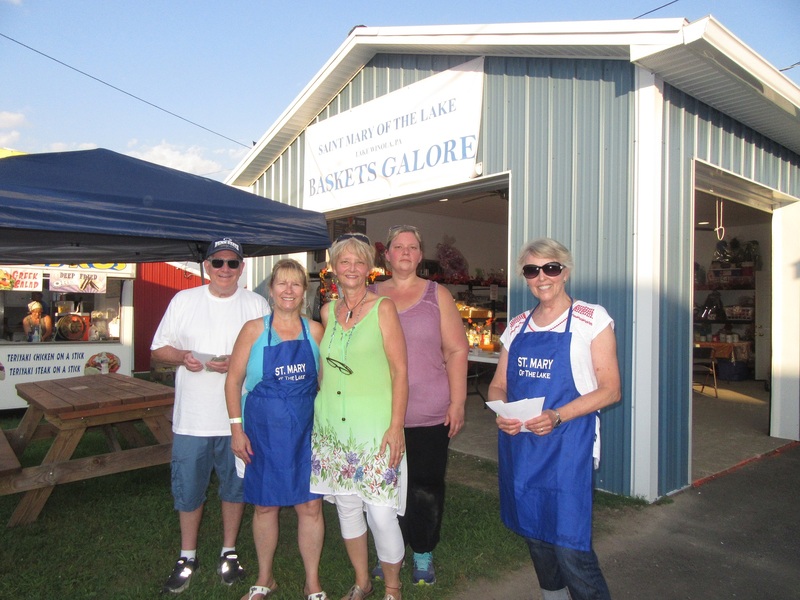 Members of St. Mary’s of the Lake, including (from left) Bill Waters, Jenny Sinker, Angela Gerstemeir, Mary Ann Barneye, and Joan Stroka, were happy to show off their new, permanent building from which they will be selling raffle tickets throughout the remainder of the fair. Roaming the midways and cracking jokes, Gizmo D. Robot is charming many a visitor to the Wyoming County Community Fair this year, including Cody Henfling of Tunkhannock and his grandmother, Chris Lubash from Lackawanna County. 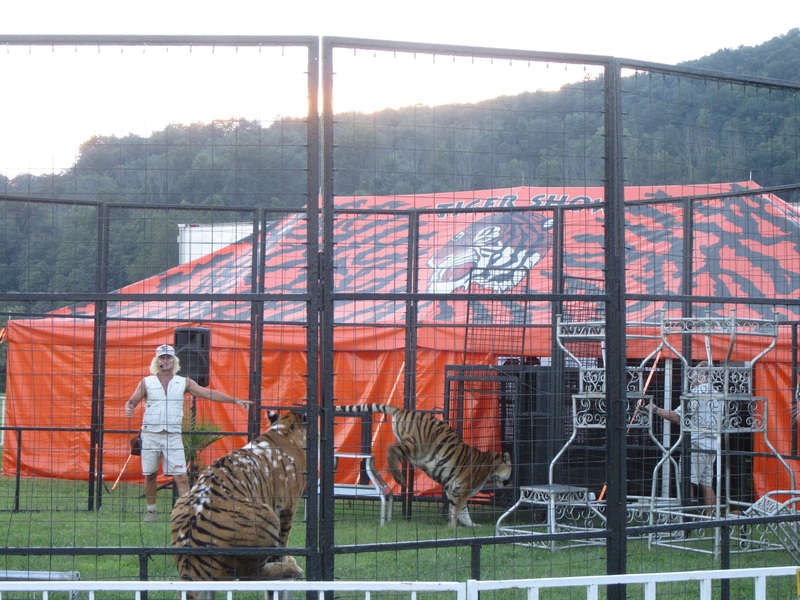 A live tiger show drew a big crowd on opening night of the fair. The show takes place at different times each day.